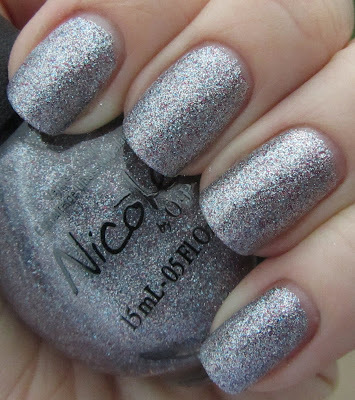 Up today are the four most recent Target-Exclusive Nicole by OPI Shades, including three shimmers and one glitter. All swatches shown without base coat, with top coat. 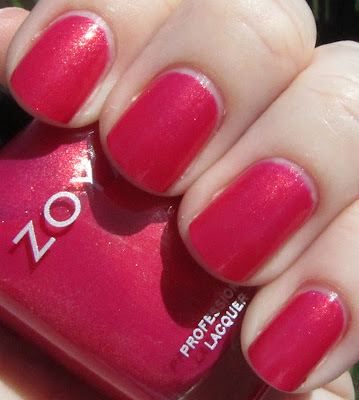 This medium pink is packed with purple and pink shimmer. 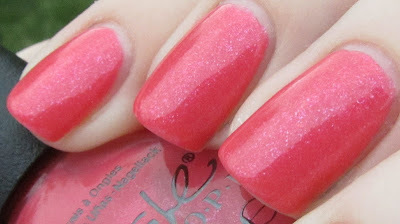 While I was a bit on the fence about this one when I saw the bottle, I love it on - it is a really great pink! Three coats for full coverage. 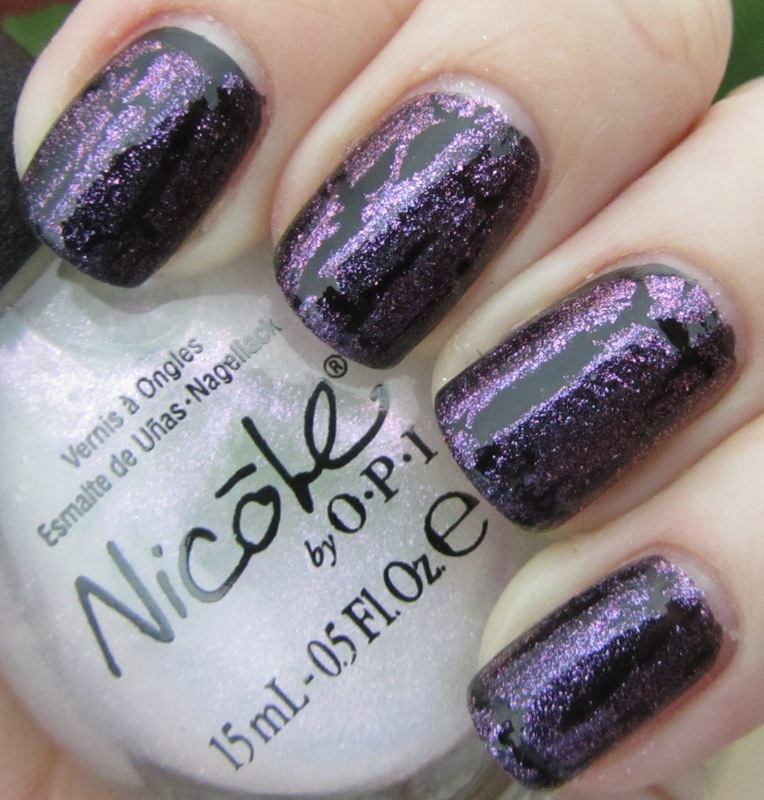 Light red-leaning purple with fine copper shimmer. While this shade might look familiar, it is actually lighter and with a finer shimmer, making it unique among the other purple-with-copper-shimmer polishes we have seen this spring. Three coats. This bright red has the most subtle shimmer - my camera didn't pick it up at all and honestly it is pretty hard to see in person as well. However, it is still a really gorgeous color - it is bright without being too bright and has just enough pink in it to make it fairly wearable. Two coats. 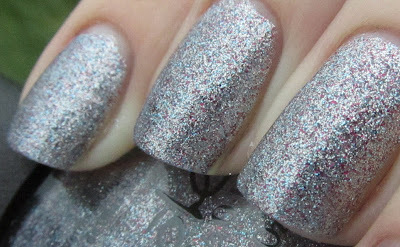 Silver glitter with blue and fuchsia glitter throughout. I love this one! While the overall look is definitely silver the color throughout gives it a really unique look. Two coats. I really like all of the colors in this collection, and they are mostly unique to other colors we have seen so far this spring. 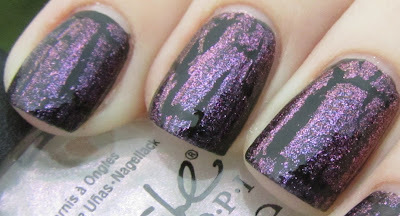 The shimmer in the pink and purple shades is just gorgeous, and the silver glitter is really fun. It is hard to pick a favorite here, they are all really great polishes! Formula was good on all of them, they didn't give me any trouble. Personally I am pretty pleased with the entire collection! 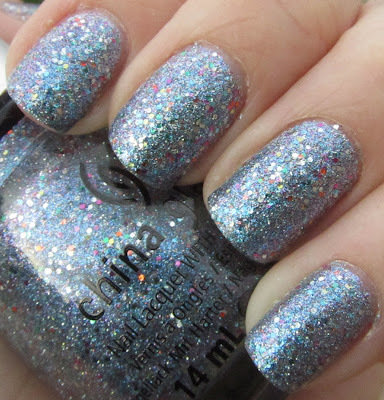 Here is one of the amazing polishes from the China Glaze Prismatics collection - my personal favorite from the collection! Liquid Crystal has a gorgeous base of medium blue with purple duochrome flash and is filled with medium-sized rainbow hex glitter. While I was a little bit bummed when I initially found out that these polishes were not holographic (as they claim to be), duochrome with rainbow glitter is still pretty good! Pretty smooth application for a glitter, I used three coats for full coverage. It was a bit hard to do justice the the duochrome with the camera, but here is a slightly better shot. Once again, while these are not holographic and that was a little sad, they are still really pretty and the prominent purple flash on this one makes it my favorite. I think the rainbow glitter is really fun as well. Love this polish! 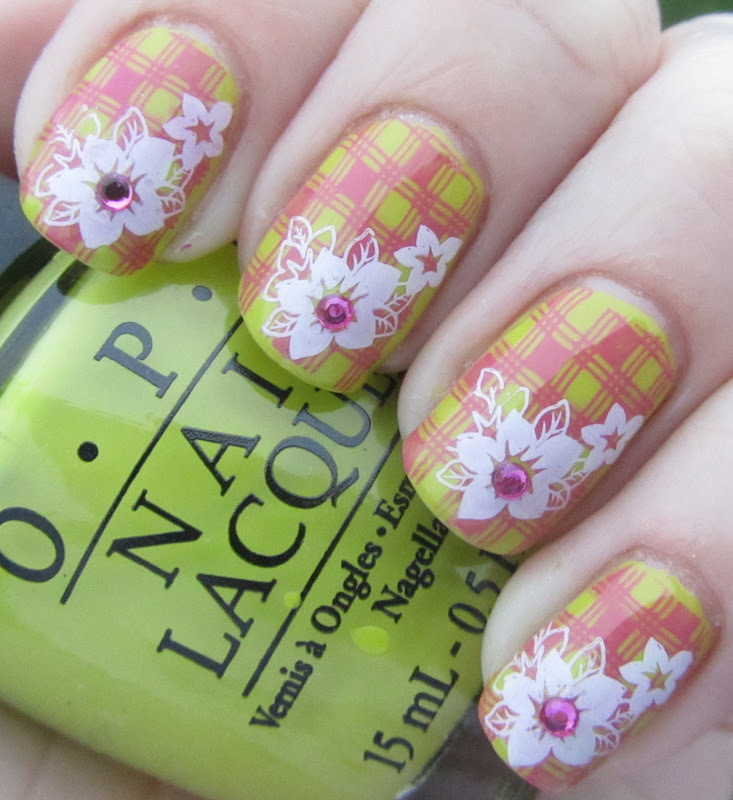 Here is a very fun little spring mani I wore a couple of weeks ago. For these nails I started with OPI Did It On 'Em from the Nicki Minaj collection, followed by stamping using Nicole by OPI All Kendall-ed Up using plate M64 and Konad Special White using plate m82. As a finishing touch I added pink rhinestones to the center of each large flower. I really like how this one turned out! Wednesday is a lovely turquoise cream. I used 2 coats for this swatch. Unfortunately, my peely nails showed up on these pictures more than they do in person, sorry! But this applied really well. It is much greener than blue, and a bit faded -- the indoors picture is much more true to life. Lara is a magenta creme. I used two coats for this one. It is not nearly as bright as the second picture; much closer to the indoors picture. Arizona is a bright orange creme. It is not neon, but it is very bright for sure! It reminds me of macaroni and cheese. It was a bit thinner than the others, and needed 3 coats. 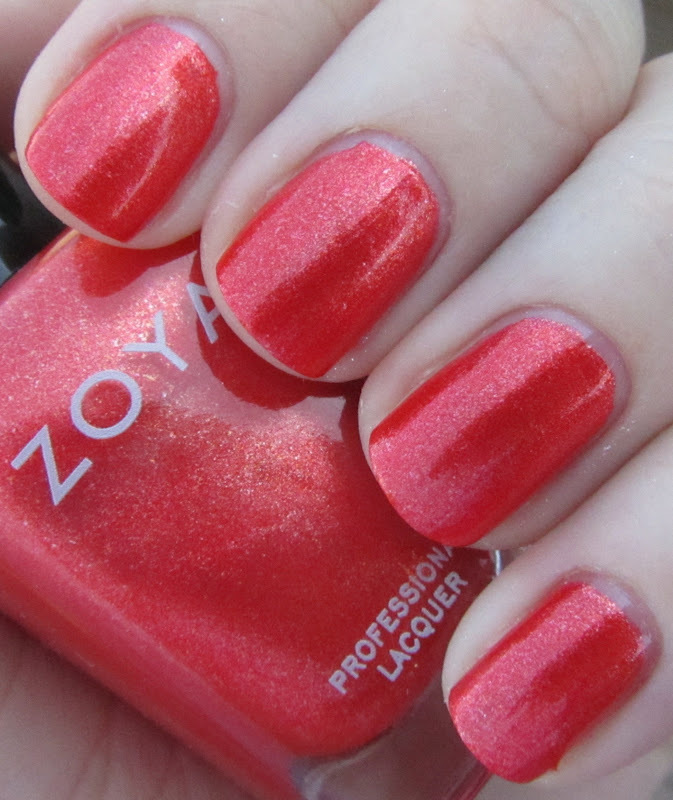 I don't usually wear oranges much, but if bright orange is your thing, this is a nice one. Shelby is a light pink creme. Like Arizona, it was a bit thinner, and needed 3 coats. 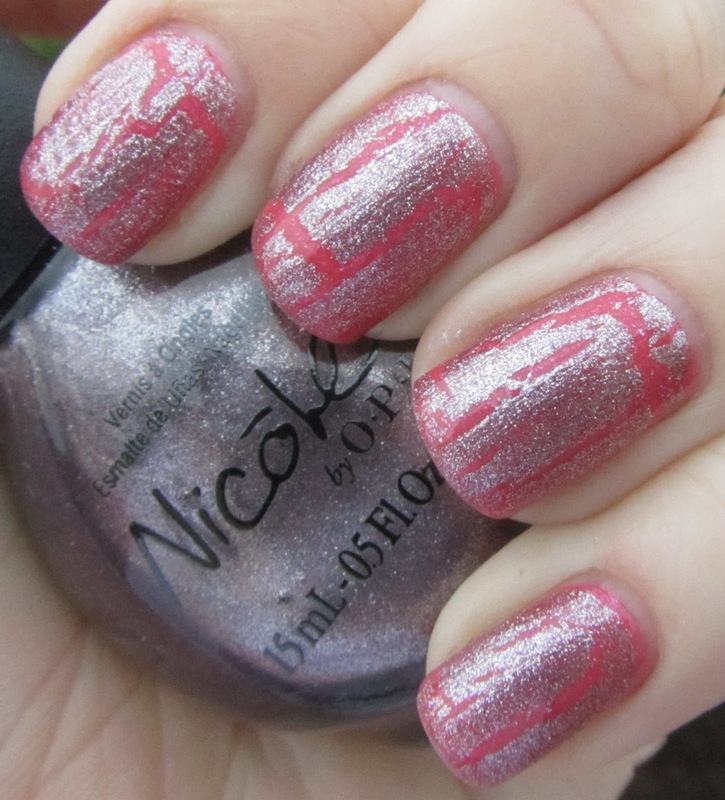 This one is super girly; reminds me of bubblegum. It's a little softer though, and not all that bright. 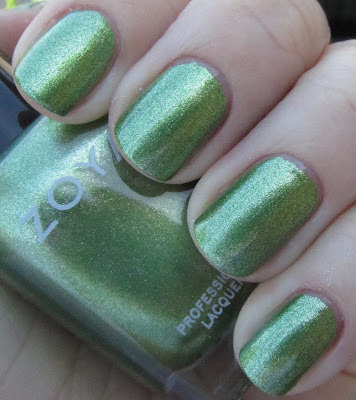 Tracie is the only non-creme of the bunch -- it is a pretty green shimmer. I don't usually do greens, but this turned out to be my favorite! Two coats here. 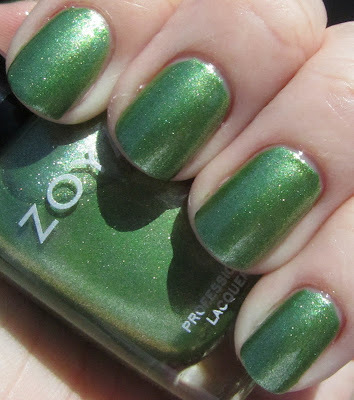 It is a soft and a touch frosty -- the Zoya website describes it as both "pistachio" and "avocado" and I think both of those are quite accurate comparisons. The entire collection is quite nice on formula. 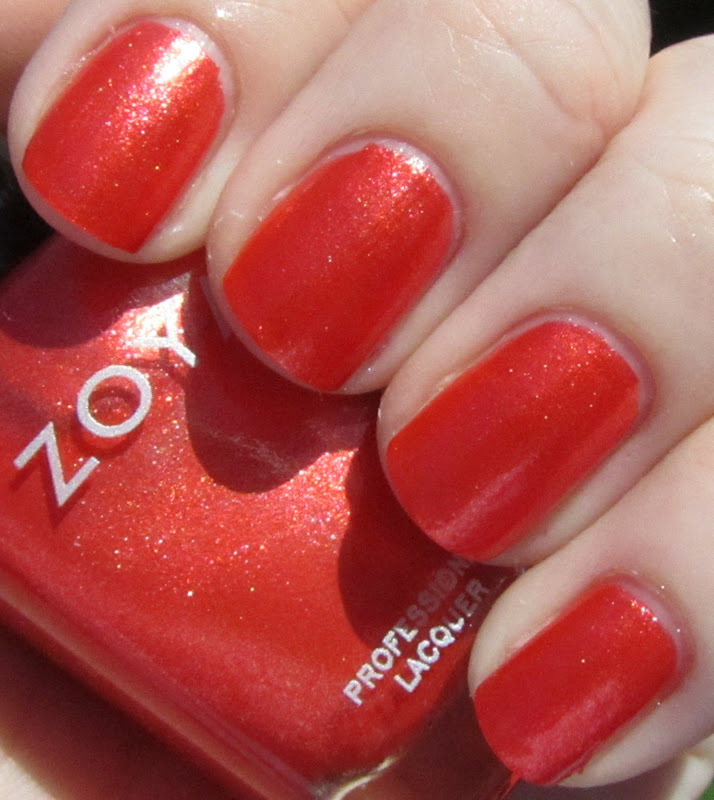 It is a little thicker than some other Zoya cremes, and mostly applied quite well in two coats, three coats tops. My favorites were Tracie, Reagan, and Wednesday, but I am sure there is something in here that will appeal to everyone. Here is a super fun polish by a really great indie brand - Whimsical Ideas by Pam. 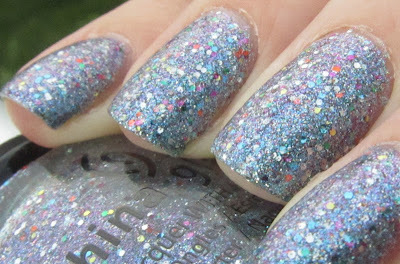 Personally I haven't yet purchased any of the awesome indie polishes floating around out there yet - lack of money, as well as any time to really look for them and decide what I would want, has kind of held me at bay thus far. This beauty is owned by my sister Becky and she was kind enough to let me use it! Seuss is a bright sky blue full of large silver hex, medium red hex and small silver hex glitters. As the base is a bit sheer on it's own, as you layer you get a really fun look with some of the silver glitters looking more pale blue. This was three thin coats. The glitter placement was a bit tough, and as you can see sometimes the larger glitter pieces try to lump together or migrate to the tip. With a bit more patience than I had you can make things look much more even though. I think she kind of nailed the inspiration, don't you think? :) Really loved this polish - I might need to be purchasing my own bottle soon! I am started to get a bit crackled out, I must admit. However these are just different enough that they renewed my interest in the crackle effect. All swatches shown with a top coat. I just had to start out with my favorite. This is a gorgeous opalescent crackle polish with a gorgeous duochrome and I pretty much love it. It works best over fairly dark colors (shown here over black). It has an amazing pink/purple/golden duochrome to it - while I had a tough time catching the gold flash on camera, here is a bit of the pinkish-purple shift up close. 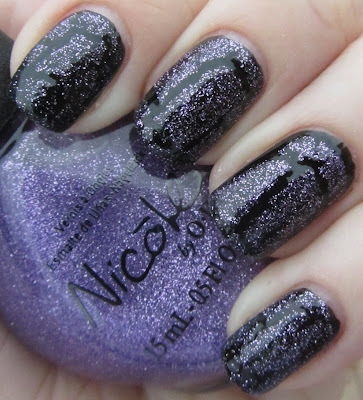 This is a medium purple glitter crackle, which goes on rather spare-looking and them groups together to a denser finish. However, it is best worn over dark or highly contrasting colors or you lose a lot of the effect. 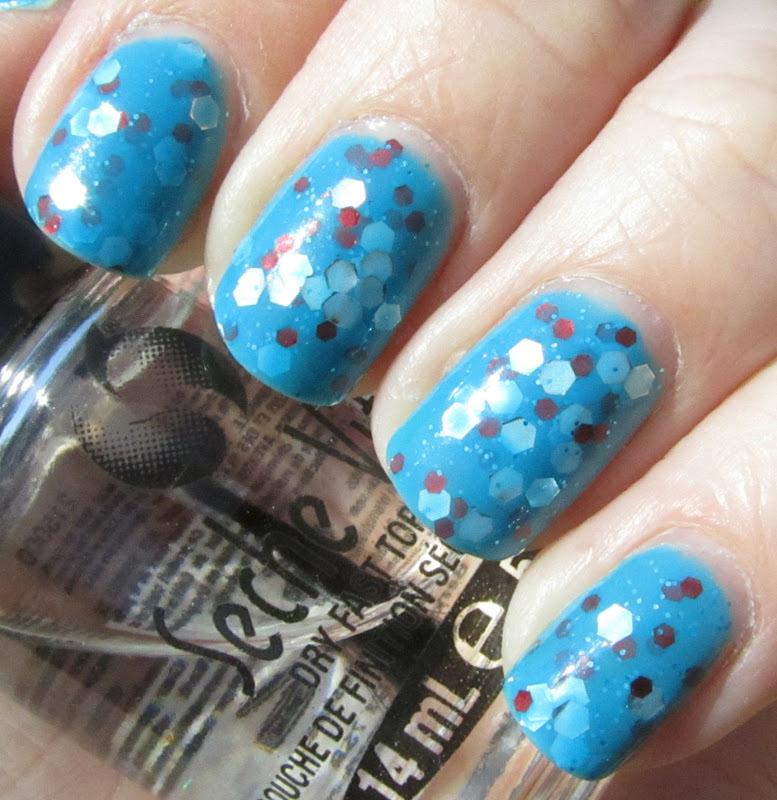 This is the bright blue version of Amethyst texture - similar sparse glitter crackle. Once again, best over dark or highly contrasting colors. 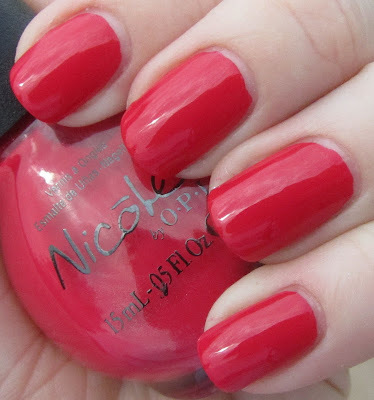 This is the only shade to be truly dense and opaque enough to go over just about any base color (here shown over Nicole by OPI Great Minds Pink Alike). It has a bit more purple in it than a standard silver crackle, making it a unique shade.